007: Quantum of Solace is a first-person shooter video game based on the films Casino Royale and Quantum of Solace. 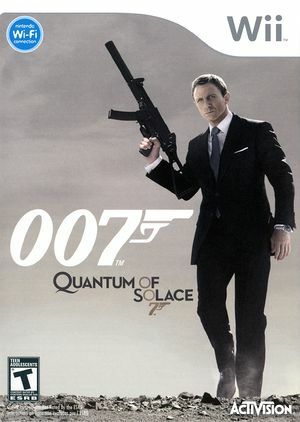 The game's release coincided with the release of Quantum of Solace. The game is the first James Bond title published by Activision; the company acquired the video game licence to the James Bond franchise in 2006. It is powered by the Call of Duty 4 game engine. It is also the first James Bond video game to be released on a seventh generation console as well as the first to feature Daniel Craig's voice and likeness, as well as those of Eva Green, Judi Dench, Mads Mikkelsen, Olga Kurylenko and Mathieu Amalric. This title runs it's intros uncapped resulting in many thousands of rendered FPS within the emulator slowing emulation significantly (i.e. typically <5 FPS). The only work around is to turn the emulated CPU clock down to a low amount so that the game runs at a respectable speed and mash A until reaching the main menu. Refer issue 9206. Many enemies may be completely blacked out when you first see them. To fix, turn the texture cache to safe. Now set via INI. When moving between shade/light, the main characters hands will flicker between the light sources. To fix, use safe texture cache. Now set via INI. The graph below charts the compatibility with 007: Quantum of Solace since Dolphin's 2.0 release, listing revisions only where a compatibility change occurred. This page was last edited on 3 May 2018, at 19:51.